Dr. Brian Ingleright, DO is a Doctor primarily located in Brooksville, FL, with other offices in Brooksville, FL and Spring Hill, FL . He has 30 years of experience. His specialties include Family Medicine. Dr. Ingleright is affiliated with Brooksville Regional Hospital, Spring Hill Regional Hospital and St. Petersburg General Hospital. He speaks English. Dr. Ingleright has received 3 awards. The overall average patient rating of Dr. Brian Ingleright is Excellent. Dr. Brian Ingleright has been rated by 15 patients. From those 15 patients 2 of those left a comment along with their rating. The overall rating for Dr. Brian Ingleright is 5.0 of 5.0 stars. Never have to wait, girls at desk very friendly and helpful.Dr. Ingleright is professional,on time and has a great bed side manor. He listens to you and speaks in terms you can understand. He is there from start to finish and if he can't fix it he will send you to someone who can and will check in with you along the was. I can't say enough good things. It is hard to find a good Dr. but if you are reading this you just did find one. Dr. Ingleright is affiliated (can practice and admit patients) with the following hospital(s). We are sorry, it looks like we don't have insurance information. Please call Dr. Brian Ingleright's office for more information. 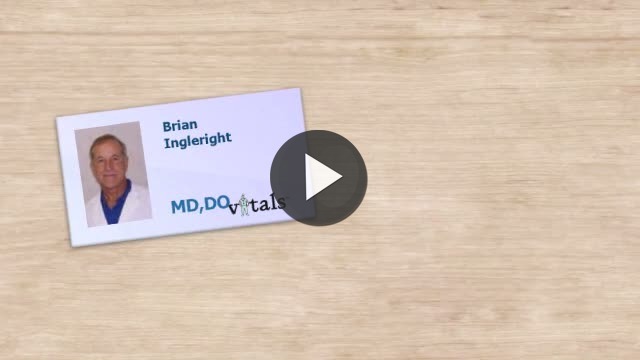 Take a minute to learn about Dr. Brian Ingleright, DO - Family Medicine in Brooksville, FL, in this video.